This Thursday (Nov. 24) the Senate approved the last amendments proposing alterations to the draft Forest Law reform bill before it goes before the full senate for voting. Although it does contain some eventual improvements in comparison with the version approved by the House of Representatives, the question of amnesty for all illegal deforestation carried out up until July 2008 remains unaltered and the criteria for defining areas of permanent protection and preservation have been relaxed. Senator for Amapa Randolfe Rodrigues (PSOL), the only member of the Standing Committee to vote against the text of the bill last Wednesday (Nov. 23) feels that the Senate as a whole needs to make an effort to defend the real interests of Brazilian society and reject the Forest Law reform bill. 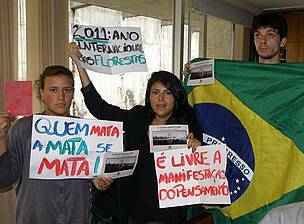 “The legal text as it stands continues to constitute a serious threat to Brazilian forests. Let us carry the struggle forward now before the full Senate house”, he declared. Although a date has not been fixed for voting in plenary session, the ruralistas (parliamentary representatives of agribusiness and big landholding interests) expect to have the bill approved in the senate and in a second vote in the House of Representatives and sanctioned by President Dilma Rousseff before the end of this year. Once again those present at the voting session in the Committee auditorium witnessed scenes of truculent behaviour on the part of the Senate Police. In silence, two Forest Agronomy students from the University of Brasília raised placards protesting against the approval of the proposed changes to the Brazilian Forest Law. They were immediately surrounded by members of the Senate Police Force, who tore the placards out of the students’ hands and took them out of the auditorium telling them that any kind of demonstration was forbidden.Strangely enough, every day that the bill came up for discussion or voting in the various senate standing committees, (Constitution and Justice; Science and Technology; Agriculture and Agrarian Reform; and Environment) representatives of the ruralistas raised their banners and frequently booed senators speaking against the proposed changes to the Forest law. They were never once molested or even approached by the Senate Police. Senator Randolfe Rodrigues took the floor to protest against the aggression of the Senate Police, but the Chairman of the Standing Environment Committee, Senator for the Federal District, Rodrigo Rollemberg (PSB), who was coordinating the session called on the Senate Police to seize the students’ placards. After the attention of the press had been drawn and various individuals had expressed their indignation at what they had witnessed, the continued presence of the students was permitted, albeit without their placards, as they had been confiscated by the police. Ligia Boueres, a student in her sixth term of the graduate course in Forestry Agronomy took part in the peaceful protest and was threatened by one of the policemen. She declares that she is in favour of a revision of the current Forest Law but not in the way it is being conducted by the Brazilian National Congress. “The legal text as it stands actually stimulates new waves of deforestation and threatens species that depend on the existence of the forests for their survival”, she declared. The student felt that it was unacceptable that society should be forbidden to express itself in the Senate. “Right now they are voting in favour of something that we disagree with; they are not entitled to prevent us from demonstrating our contrary point of view in a peaceful manner”, she insisted. Senator Randolfe Rodrigues felt that the repeated suppression of students and representatives of the social movements by the Senate Police was an extremely serious matter. “The free expression of individual positions is something guaranteed by the Federal Constitution itself, and it cannot be arbitrarily suppressed. These abuses are affronts to the Federal Constitution”, he protested. On November 8, the Senate Police committed aggressions, including the use of stun guns, against peaceful demonstrators protesting against the proposed changes to the Forest Law.